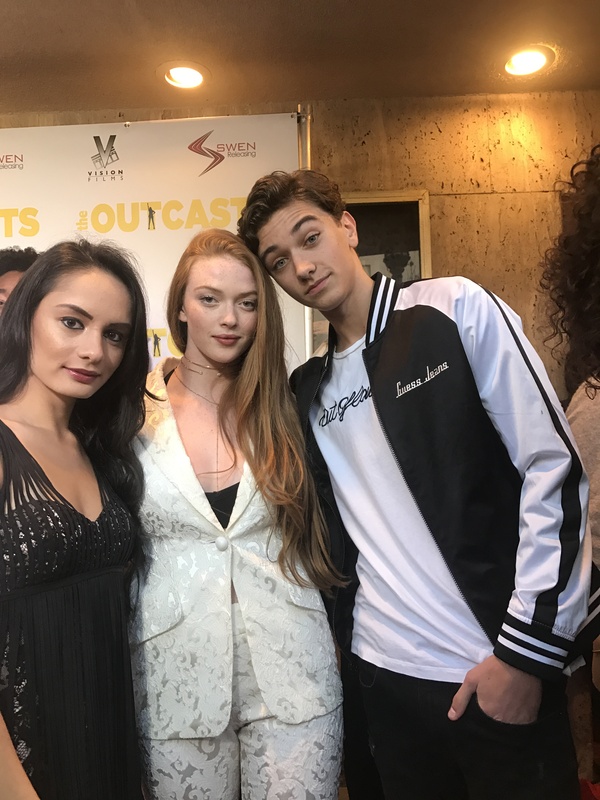 VIPAccessEXCLUSIVE: Larsen Thompson And Gavin Casalegno Interview With Alexisjoyvipaccess At “The Outcasts” Movie Premiere! There is no question about it – Larsen Thompson and Gavin Casalegno are both totally taking over the entertainment world by storm! We all know the extraordinary and stupendous Larsen Thompson for being one in-demand and magnificent model in addition to being a dancing sensation. She’s a familiar face in some of the most renowned campaigns and has worked with Betsey Johnson for her Capezio campaign, GAP for their GapFit campaign, Hollister, Dior, and many more. Larsen Thompson has been traveling around the world continuing to establish herself as the fashion icon and inspiration that she is to everyone. We’ve also seen Larsen Thompson in many music videos including being the lovely leading lady in BORNS’ “American Money” music video, Katy Perry’s “Chained To The Rhythm” music video, and Sia’s “The Greatest” music video, amongst many others. Larsen’s unique and out of this world dancing skills sets her apart from others and we all truly can’t get enough of watching her impeccable and indescribable talent in all of her dance videos. Despite all of her massive success, Larsen Thompson remains to be one of the most genuine, sweetest people on this planet and she truly deserves all of her awe-inspiring successes and the many more coming. Actor Gavin Casalegno has a lot of brilliant and exciting projects up his sleeve. We’ve seen him exhibit his excellent talent in many terrific projects including The Vampire Diaries and the film, Noah. Now, Gavin is ready to share two very special projects, his work with Sage Alexander, which is set to be either a movie or series as well as his highly-anticipated, short film titled, Nine Seconds. Gavin Casalegno has an amazing acting talent and we know that all of his projects will be phenomenal. I, Alexisjoyvipaccess had a fantastic time covering and attending The Outcasts movie premiere and had an outstanding time catching up with and interviewing the remarkable Larsen Thompson and Gavin Casalegno at the event. Larsen Thompson and Gavin Casalegno dished exclusively to Alexisjoyvipaccess all about their marvelous, upcoming projects that they are working on and they both send out some exceptional messages to all of their fans. Plus, since The Outcasts movie focuses on the high school atmosphere we all know and remember, Larsen and Gavin even give each other superlatives – find out who is the “Class Clown” and hear what they had to say in our VIPAccessEXCLUSIVE interview below! Thanks for the fun interview, Larsen and Gavin! Check out my VIPAccessEXCLUSIVE interview with the incredible Larsen Thompson and Gavin Casalegno at The Outcasts movie premiere below! Previous VIPAccessEXCLUSIVE: Jake Allyn Interview With Alexisjoyvipaccess At “The Outcasts” Movie Premiere! Next VIPAccessEXCLUSIVE: Eden Sher Interview With Alexisjoyvipaccess At “The Outcasts” Movie Premiere!